Join us for our InterNations July Event at Kazé, Lavelle Road. 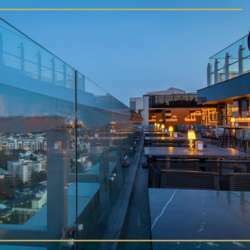 You’ll enjoy not only the great company of fellow global minds but also fantastic city views from the 21st floor open-air rooftop, lip-smacking Asian food and delicious drinks, and listening to great music. Bring along your friends, colleagues, family, but don't forget to invite them to join InterNations first! Looking forward to another awesome event to welcome new expats to Bangalore!